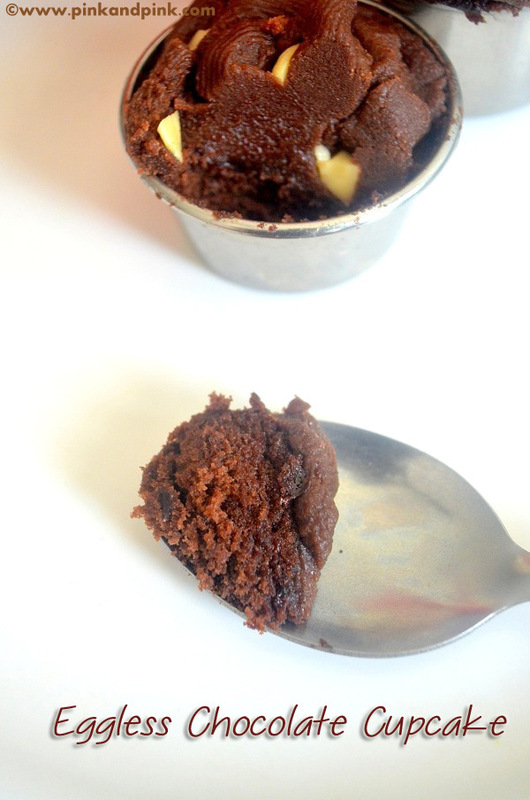 Eggless Chocolate Cupcakes - A recent addition to my pressure cooker baking list. To be more specific, I have made these eggless chocolate cupcakes in my pressure cooker without oven. You can follow the same recipe and bake in your oven. I made my first frosting when I tried these egg free chocolate cupcakes. I was very happy with the results. There may be many of you who wants to make cupcakes in cooker for so many reasons. It is an awesome feeling to see the cupcakes beautifully rising in your cooker. Are they not better than bakery ones especially for your kids? After trying eggless brownie, eggless tutti frutti cake and eggless rava cake in pressure cooker, I am very much comfortable now in making pressure cooker cakes. 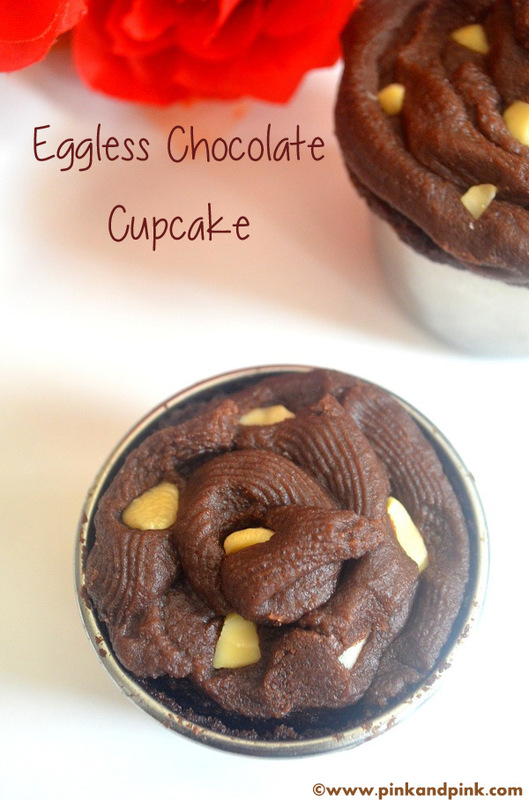 But this eggless chocolate cupcake is the first one in my list of pressure cooker cupcake recipes. Here is the recipe for you to learn how to make cupcakes in pressure cooker with step by step instructions and picture. These are egg free cupcakes. I have added 2 tsp curd of make these cupcakes without eggs. The cupcakes were soft, moist, spongy as each and everyone of you would love. I have made these eggless cupcakes with plain flour(maida). I have made eggless vanilla cake in pressure cooker and it is made using rava(sooji). 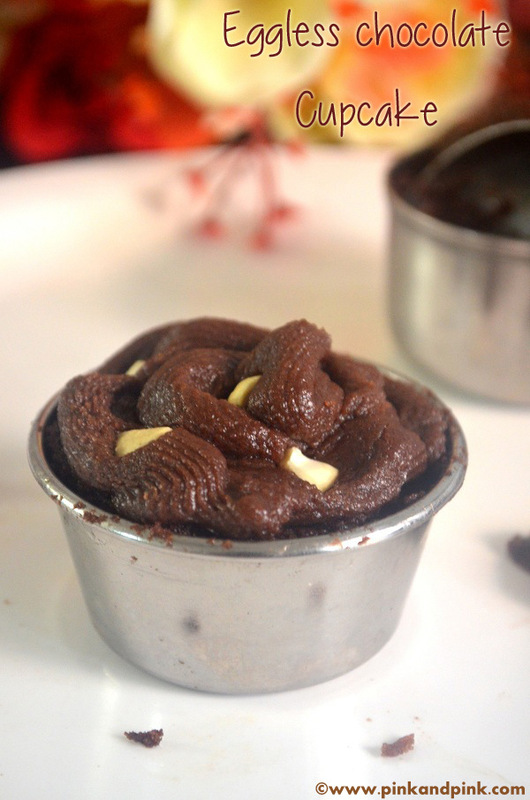 You can follow the ingredients list of the sooji pressure cooker cake recipe and make cupcakes in the same way. Eggless Cupcakes Recipe | Eggless Chocolate Cupcake Recipe - Learn how to make cupcakes without eggs and enjoy egg free cupcakes at your home. Make them in pressure cooker without oven. Take powdered sugar and butter in a wide mixing bowl and whisk until light and fluffy. I used an electric blender to whisk. You can also use hand whisk. Add plain flour, cocoa powder, baking soda, baking powder, vanilla essence to the mixing bowl. Add 1/2 cup milk. Combine everything to make the cupcake batter. You can additionally add 1 or 2 tbsp milk if the batter is too thick. The batter should be slightly thicker than idli dosa batter. I had to add additional 2 tbsp of milk for my eggless cupcake batter. Once the batter is ready, add curd and combine again. I would recommend to keep addition of curd at last so that you can adjust the measurement of curd according to its sourness. If the curd is too sour, reduce the quantity. Check the taste after adding 1 tsp and then add another tsp if required. Take cupcake moulds or stainless steel bowls as I showed in the picture. Grease the bowls with olive oil or butter. Fill the batter in each mould. Make sure to fill only 2/3 full as the batter will rise and it should have room for rising in the bowl. Arrange the bowls in pressure cooker container in which you cook rice. Make sure that you leave 1 inch gap between each bowls. I had to take 2 bowls from the container when the batter started rising as I felt extra spacing was required. I placed the 2 bowls in refrigerator and ate it. They were so nice. Preheat pressure cooker for 4 minutes. For preheating the cooker, remove whistle and gasket, close the lid and heat the pressure cooker for 4 minutes.Once the cooker is heated, place the cooker plate or any other similar perforated plate on the cooker as shown in picture. Place the container with the bowls carefully on top of the plate. Cover it with a thick stainless steel lid. You can also use cooker lid but without whistle and gasket. Do not cover the entire cooker. You need to cover only the cake pan if you are not using cooker lid. Refer Notes section for more details. Cook in medium flame until a tooth pick or a buttered knife comes out clean. It took 25 minutes for me approximately. The cooking time varies based on several factors. Check Notes section for more details. Keep it closed for 5 minutes before taking out. Remove the cup cakes from the cooker within 5 minutes after you switch off the stove. Otherwise the moisture content in the cake will start evaporating and the water drops back to the cake which will spoil the cake. Allow the eggless chocolate cupcakes to cool down before decorating with frosting. Otherwise the frosting will melt down. For chocolate frosting, whisk butter and sugar(use icing sugar or powder if normal sugar) until they turn light and fluffy. Add cocoa powder and mix well. Sprinkle milk little by little to bring it to the consistency of frosting cream. Add little more or water and boil if you are using normal sugar. It should be easy to spread, squeeze. It should be slightly thicker than ketchup. These Eggless Chocolate cupcakes are very tasty and frosting is not mandatory. These cupcakes are tasty as such even without eggs. Enjoy egg free cupcakes. Preheat pressure cooker for 4 minutes. For preheating the cooker, remove whistle and gasket, close the lid and heat the pressure cooker for 4 minutes.Once the cooker is heated, place the cooker plate or any other similar perforated plate on the cooker as shown in picture. Place the container with the bowls carefully on top of the plate. Cover it with a thick stainless steel lid. You can also use cooker lid without whistle and gasket. Do not cover the entire cooker. You need to cover only the cake pan if you are not using cooker lid. Refer Notes section for more details. Cook in medium flame until a tooth pick or a buttered knife comes out clean. It took 25 minutes for me approximately. The cooking time varies based on several factors. Check Notes section for more details. Keep it closed for 5 minutes before taking out. Remove the cup cakes from the cooker within 5 minutes after you switch off the stove. Otherwise the moisture content in the cake will start evaporating and the water drops back to the cake which will spoil the cake. Allow the eggless chocolate cupcakes to cool down before decorating with frosting. Otherwise the frosting will melt down. 1. I always use thick stainless steel lid to cover the cake batter while cooking. I do not use pressure cooker lid to cover. It is believed that the cooker's safety valve and other parts might get damaged on long term usage. It is also easy to check the progress as and when we desire. 2. I placed the stainless steel bowls inside a container in which I usually cook rice. It is easy to cover the batter instead of closing individual bowls if placed directly on the perforated plate. It is also easy to handle. 3. I always use my Prestige Deep pressure pan to make pizza, cookies and cupcakes as it is wide and accommodate more quantity at a time than normal pressure cooker. You can also make in normal pressure cooker but you cannot cook more cupcakes in one shot. 4. The cooking time varies depending on several factors like the intensity of the stove's flame, thickness of cooker & container, batter consistency, ingredients and so on. 5. If you are making cakes in pressure cooker for first time, keep checking the consistency after 15 minutes. It might extend the cooking time. But you can make sure that the cupcakes do not get burnt. Remove the cup cakes from the cooker within 5 minutes after you switch off the stove. Otherwise the moisture content in the cake will start evaporating and the water drops back to the cake which will spoil the cake. 6. You can follow the same recipe and cook in oven. It will take 20-22 minutes approx. 7. The cupcakes were good for 3 days even without refrigeration. I do not know how long they will be good as they were finished up in 3 days. Don't forget to check my other pressure cooker cake recipes. If you have any doubt in the process, feel free to comment your query. Happy pressure cooker baking! !